When they first came onto the market, lab-grown diamonds weren’t necessarily seen as a major threat to big diamond companies and their traditionally mined gems. But as lab-grown diamonds continued to grow in popularity over the years because of its slightly cheaper price point, diamond giant De Beers announced a change in strategy. 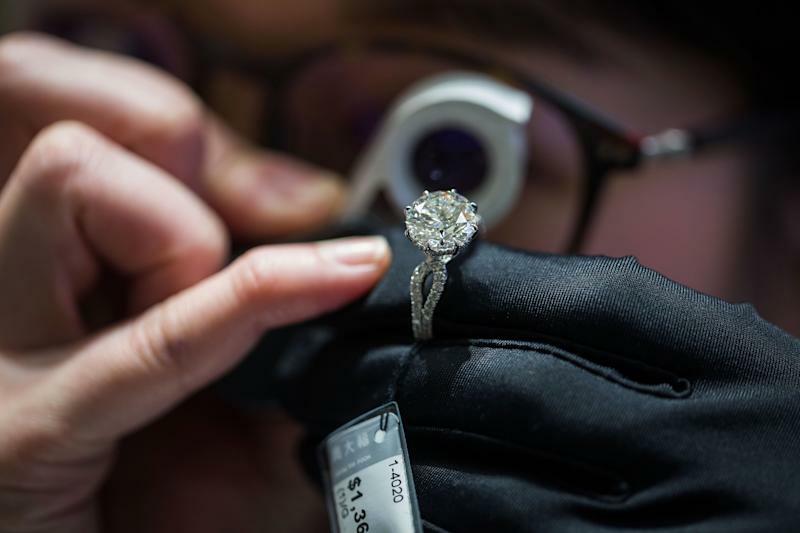 After years of discrediting lab-grown stones as inferior, the 131-year-old company turned heads when it announced last summer that it would start offering lab-grown diamonds. In an effort to undercut young lab-grown industry, De Beers, the former diamond monopoly credited with successfully marketing the diamond ring as a symbol of engagement and coining the slogan “A Diamond is Forever,” started selling lab-grown stones through its Lightbox subsidiary at a price point far below where other lab-grown startups had been pricing their inventory. Lab-grown diamond companies, however, are skeptical that De Beers’ tactic will lead to their downfall. Instead of charging the average $4,200 for a 1-carat lab-grown stone like other synthetic diamond sellers, De Beers’s Lightbox prices its lab-grown diamonds at an average of just $800 per carat. The average cost of a 1-carat mined diamond is $6,000. Weindling also refuted a year-end Reuters report that claimed De Beers’ strategy to differentiate lab-grown stones as an inferior, cheaper category below that of mined diamonds, was working. The report claimed the price spread between lab-grown diamonds and mined diamonds had widened from about 30% at the start of 2018 to more than 40% by mid-November, according to analysis from industry analyst Paul Zimnisky. Overall demand for larger lab-grown diamonds, the kind mostly reserved for center stones in engagement rings, have continued to outstrip supply, according to Weindling, the founder of the second-largest lab-grown diamond brand. Of course, there were other factors potentially at play, including a steep drop in diamond production costs for lab-grown manufacturers as well as increasing competition among lab-grown jewelry sellers. A Bain & Company report found that the cost to make a diamond in 2018 fell to $300 from $500 per carat, compared with $4,000 per carat in 2008. It’s also important to note that De Beers’s Lightbox does not have its lab-grown gems independently rated by gemological societies on cut, clarity, or color the same way that other lab-grown sellers do to match the authenticity of natural diamonds. Weindling sees De Beers’ move as likely intentional and just another attempt to delegitimize lab-grown diamonds. Natural diamond players, for their part, have also addressed concerns some consumers often mention in the debate of lab-grown versus natural diamonds. Questions about where a particular diamond is sourced from and the prevalence of so-called mined “blood diamonds,” have diminished since the implementation of the Kimberly Process, an international certification scheme established in 2003 to eliminate the sale of conflict diamonds. Today, an estimated 99.8% of all diamonds on the market are said to be Kimberley Process-compliant, according to the group. Critics, however, point out diamond smuggling operations in countries like Zimbabwe still present a problem in skirting certification. Indeed, consumer perceptions of lab-grown diamonds will be crucial if De Beers wants to successfully protect the profits it makes by being able to continue charging more for mined diamonds. As Bain predicts, the value of mined diamonds hinges on consumers differentiating lab-grown diamonds as a separate category entirely. If the two types of diamonds come to be viewed as interchangeable products, Bain’s model projects a 25%-30% drop in the natural value of mined diamonds by 2030. “They’re not to celebrate life’s greatest moments, but they’re for fun and fashion,” he said. Editor’s note: Natural diamonds, which have faced concerns over originating from illicit trade practices in the past, are mostly legitimized by the Kimberley Process, which certifies natural diamonds as conflict-free. That fact was added to this article on January 18, 2019.